GOT SOMETHING BIG TO SOLVE? U of T Engineering graduate programs can get you closer. 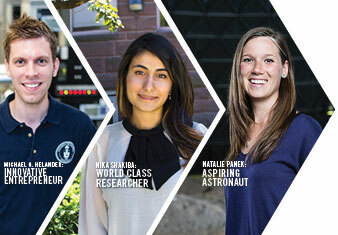 Where will graduate studies at Canada's #1 Engineering School take you? The St. George campus is in the heart of Toronto’s Discovery District. Our neighbours are some of North America’s leading startup incubators, world-class hospitals, diverse industries and Canada’s financial hub. Professors and lecturers are world-class researchers, industry leaders and successful entrepreneurs — making them exceptional educators and professional contacts. Our research consistently earns support from federal and provincial research funding agencies, including the greatest share of NSERC funding among our peer institutions. Our community is defined by collaboration, technical ingenuity and creative trailblazing. Several of our most innovative research hubs will be housed in the new Myhal Centre for Engineering Innovation & Entrepreneurship. Whether you’re destined for a career in academia, industry or aim to create your own startup, we offer several opportunities to help tailor your experience to meet your goals. Research at U of T Engineering extends far beyond our campus. Students and professors collaborate extensively with researchers and companies worldwide to address the world’s most pressing challenges.